In 2006 the everyday life of the town of Ipswich was shattered by the discovery of the bodies of five women. The residents of London Road had struggled for years with the soliciting and kerb-crawling on their street. When Steve Wright, the occupant of number 79, was arrested, charged and then convicted of the murders, the community grappled with the media frenzy and what it meant to be at the epicentre of this tragedy. Playwright Alecky Blythe recorded extensive interviews with the residents of London Road and turned them into an intelligent, startling and raw piece of theatre. Tony Award winner Adam Cork's score uses the melodic and rhythmic speech patterns captured on those recordings to create this extraordinary work. London Road is an experimental and challenging musical documentary which reveals the ways in which even the darkest experiences can inspire a community. London Road was originally performed at the National Theatre in 2011, winning the Critics’ Circle Award for Best Musical. A feature film of the production was made in 2015 starring Olivia Colman and Tom Hardy and including many of original cast. 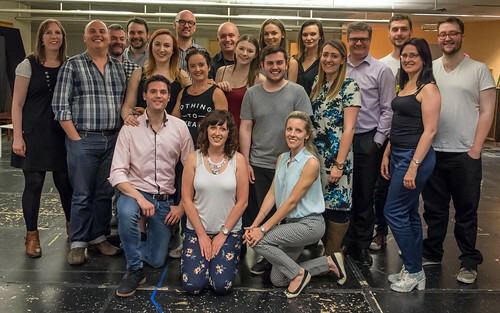 Here’s Alecky, plus original National Theatre London cast members Nick Holder and Michael Schaeffer, with the Sedos cast of London Road.